How do you launch a recording of lovely music written by a little-known composer like Michael Hurd? By singing it in a concert of course! So we’re really pleased to launch this recording on the label Lyrita Recorded Edition at a concert in St John’s Smith Square on the 14th April 2018. This was another new experience for Hertfordshire Chorus. The British Music Society approached us about recording five works by British composer Michael Hurd. Michael Hurd died in 2006, aged 77 after 50 years composing a wide variety of music. The BMS established a charitable trust to administer a legacy from his estate, with the aim of fostering and encouraging recordings and performances of his music. He is perhaps best known for his Jonah-Man Jazz, sung by countless schoolchildren over the years. Our task was not only to record the five compositions but also to project manage the recording! No small undertaking! Music Director David Temple and Operations Director Robin Seaman set about organising the long list of things that had to be done. St Jude’s Church in Hampstead is well known for its acoustic and is often used as a recording venue. We approached the London Orchestra da Camera, a regular concert partner. Place and orchestra sorted. Next task was to find a soloist for one of the pieces and we were very pleased to discover mezzo-soprano Marta Fontanals-Simmons. All coming together – now we had to find a producer and recording engineer and turned to Gareth Williams, with whom we have worked a number of times. Finding the people and venue was only half the task, since we also had to find dates when all were available. No easy task when everybody’s diaries were so full. And don’t forget our own singers and their availability! A complex thing to organise and the recording dates seemed to be upon us very quickly. So on a rainy morning on the 20th May 2017 the choir, orchestra, conductor and recording crew gathered at the church. 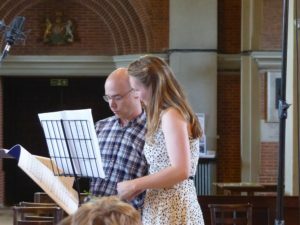 A second full recording day was held on the 3rd June 2017 when our soloist joined us. The church needed to be set-up early in the morning on each day and then, recording finished, everything had to be cleared away, equipment packed in the van and the church returned to its primary function as a place of worship ready for the services the next day. So what of Michael Hurd’s music did we record? 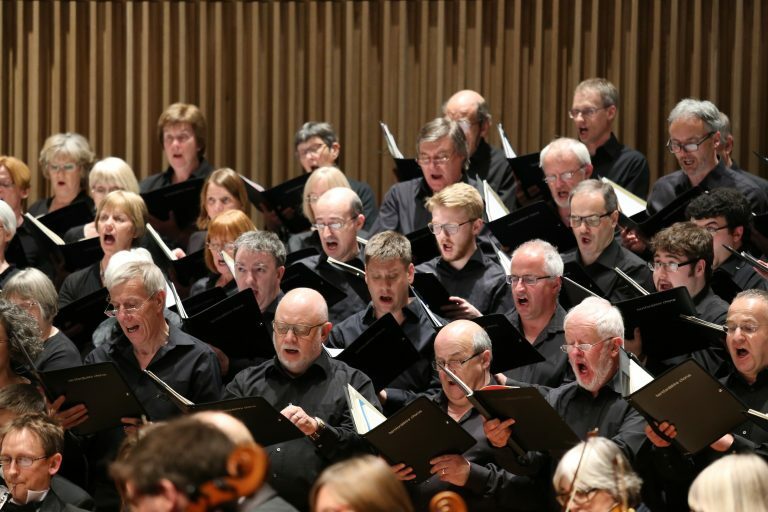 A Choral Cantata – words from Psalm 150 and from Richard Edwards and Tate & Brady, written in 1991 commissioned by the Southport Bach Society (now Choir) and first performed on 22 June 1991. 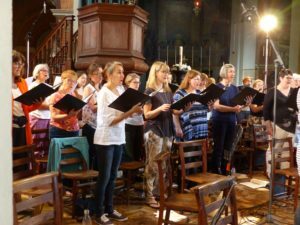 Music’s Praise – setting words from Alexander Pope, William Strode, William Shakespeare and Robert Herrick, commissioned by the Stroud Festival and first performed by the Festival Choir with Orchestra da Camera on 30 October 1968. The Phoenix and the Turtle – setting words by William Shakespeare, commissioned by the Canterbury Singers and first performed on 6 June 1974 in the Chapter House Canterbury Cathedral. A Song for St Cecilia – setting words by John Dryden, written for performance at the Havant and District Schools’ Music Festival in 1967. This Day to Man – six hymns for the Nativity, commissioned by the Chichester Singers and first performed on 14 December 1974. They were two long and tiring days of recording. Occasional interruptions included emergency vehicle’s sirens and aeroplanes passing overhead. A couple of the minor inconveniences of non-studio recording, especially in London! But the experience was utterly rewarding. We discovered some gems, really lovely music that was a joy to sing. Recording over, we go back to our other work, sad to leave this music behind for the time being. We do hope that Michael Hurd’s choral music will be rediscovered through this and other recordings. So to conclude this blog the recording release date was the 6th April 2018. We also made Michael Hurd’s music the centrepiece of our concert on 14th April 2018 joined by our sister choir Crouch End Festival Chorus and the original commissioner of The Phoenix and the Turtle. We were absolutely delighted that our CD reached number 7 in the Specialist Classical Charts in the first week of sales and equally delighted with this fantastic review in Gramophone “This important release should be in every keen choral singer’s Christmas stocking.” Read the whole review . Gramophone Review. In addition to Gramophone, we had a wonderful review by Rob Cowan in Classical Ear. Read it here Classical Ear. 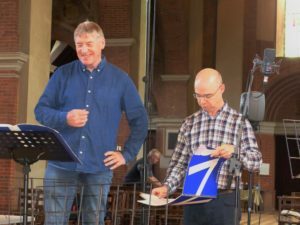 In 2009 we commissioned Will Todd, who wrote the highly successful Mass in Blue for us, to write a setting for Ode to a Nightingale for one of our Patrons, Rod Jones. We launched it in the Barbican in 2011 and sang it again a few years later because we loved the luscious writing. In 2011 we commissioned James McCarthy, who David Temple and Crouch End Festival Chorus had commissioned the powerful oratorio 17 Days, to write about the life of Alan Turing. We launched the resulting piece Codebreaker in 2012 and sang it again in 2015, both times in the Barbican. We felt both pieces deserved to be better known and several of our members raised the funds to make a high quality recording. 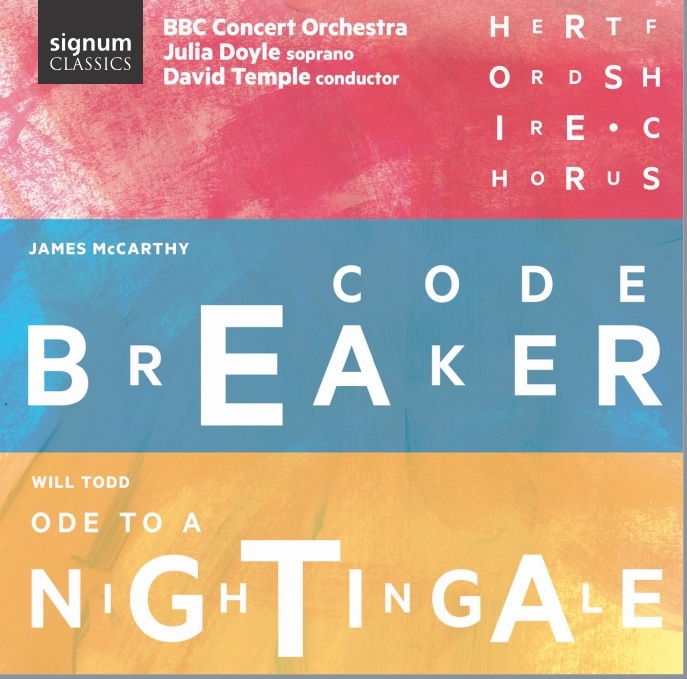 Moving on, in June 2016 we gathered at the Watford Colosseum with the BBC Concert Orchestra, Producer Nigel Short, Conductor of Tenebrae, and of course our Music Director David Temple to make the recordings. We were delighted to have the support of Signum Records who agreed to publish the music in 2017. Roll forward to the launch in October 2017. To celebrate, we sang both pieces at St Albans Cathedral on the 7th October to a standing ovation. To add to the celebration we shared the stage with American choirs, Nashville in Harmony and One Voice Chorus of Charlotte and St Albans School Chamber Choir. Nashville in Harmony and One Voice discovered Codebreaker and were so moved by it that they performed it several times earlier this year. Another new experience for Hertfordshire Chorus. 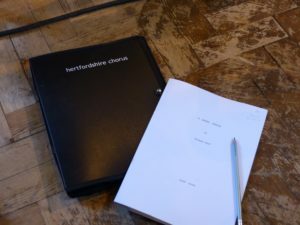 The British Music Society approached us about recording five works by British composer Michael Hurd. Michael Hurd died in 2006, aged 77 after 50 years composing a wide variety of music. The BMS established a charitable trust to administer a legacy from his estate, with the aim of fostering and encouraging recordings and performances of his music. He is perhaps best known for his Jonah Man Jazz, sung by countless schoolchildren over the years. Asked to not only record the five compositions, we were also to project manage the recording! No small task. Music Director David Temple and Operations Director Robin Seaman set about organising the long list of things that had to be done. St Jude’s Church in Hampstead is well known for its acoustic and is often used as a recording venue. We approached the London Orchestra da Camera, a regular concert partner. Place and orchestra sorted. Next task was to find a soloist for one of the pieces and we were very pleased to discover mezzo-soprano Marta Fontanals-Simmons. All coming together – now we had to find a producer and recording engineer and turned to Gareth Williams, with whom we have worked a number of times. Finding the people and venue was only half the task, since we also had to find dates when all were available. No easy task when everybody’s diaries were so full. And don’t forget our own singers and their availability! We already knew that the recording is to be released on the Lyrita Recorded Edition label, so liaising with them is for later. A complex thing to organise and the recording dates seemed to be upon us very quickly. 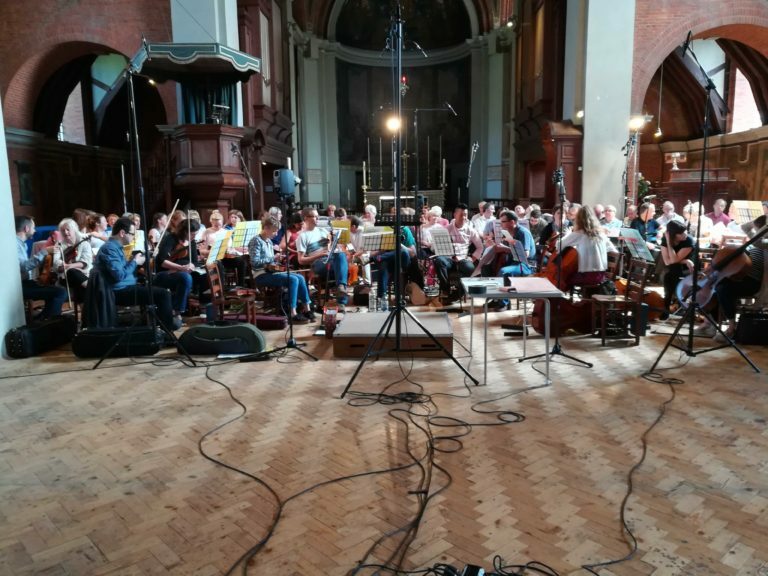 So on a rainy morning on the 20th May the choir, orchestra, conductor and recording crew gathered at the church. 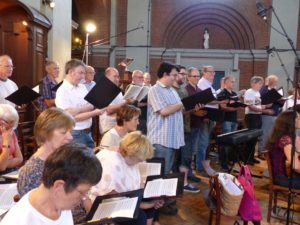 A second full recording day was held on the 3rd June when our soloist joined us. The church needed to be set-up early in the morning on each day and then, recording finished, everything had to be cleared away, equipment packed in the van and the church returned to its primary function as a place of worship ready for the services the next day. So what did we record? Recording over, we go back to our other work, sad to leave this music behind for the time being. We do hope that Michael Hurd’s choral music will be rediscovered through this and other recordings. We plan to do our bit by scheduling a special concert in 2018 which will feature some of the pieces. This will coincide with the launch of the CD. Watch this space for details when we have them. Performers put their heart and souls into the best show they can and reading reviews is always carried out with a little trepidation, so how wonderful it was to read John Manning’s review of our performance of Elgar’s The Kingdom in the Herts Advertiser. You can read it too here. Come and join our first rehearsal of Rachmaninov Vespers and you could be singing with us in St John Smith Square in April, a “must sing” for basses. Download the full flyer with all details here. Find out more about what it’s like to sing with us in our recruitment leaflet here. Alternatively find out more by sending an email to membership@hertfordshirechorus.org.uk or by phoning 01462 491647.